A bus carrying 60 passengers to a religious event in the Santa Catarina state of Brazil plunged over a cliff on Saturday evening. 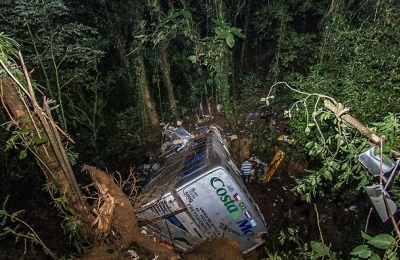 The driver reportedly lost control whilst approaching a curve, leading the bus to fall 400 metres into a wooded area just ten kilometres away from Joinville, the final destination. Whilst the cause of the accident is not yet confirmed, police believe that the brakes on the vehicle may have failed. Approximately 100 rescue workers, plus fifteen ambulances and a helicopter were on the scene; although, the accident happened at nightfall making access to the area difficult. President Dilma Rousseff expressed her condolences upon hearing the news, saying: "In this hour of pain of suffering, I want to extend my sympathies to the families and friends who have lost their dear ones." The roads that wind through the Dona Francisca mountain range are notoriously dangerous, with 110 fatalities on these roads in the past five years, according to police. Throughout the nation, with the World Health Organisation stating 43,000 people die annually in accidents on the congested and poorly maintained roads. The first funerals for the recovered victims are to take place Monday.